In this Instructable I will walk you though designing and building a really fancy looking Lightbox. I am very lucky and have access to Laser cutters, a full wood shop, paint booth and many other fancy things. Even though I used these things, it doesn't mean that it can't be done using basic hand tools or small power tools. So there are two Basic way's to make a Light Box, the first is to make a simple box, cut out a shape in the front, place paper behind it and then light it. The second way, what I am going to show you is to make a Lightbox with two layers on the front. What that means is the front of the box has a layer of etched/painted Acrylic, with a layer of wood on front. The easiest way to do this is to make the front two layers out of half the thickness of the rest of the box. For instance if you make the box out of 1/4in wood, make the Acrylic and wood on the front 1/8in. Now I will split this in to two different sections. I use Maker Case, it's amazing, you just chose the thickness of material you are making and tell it your dimensions, and boom plans you can download. Now you don't need a laser cutter, but man does it make it easier. If you don't have access to a laser cutter then you will have to print out your plans and glue them to the wood and cut them. Also you will have to get some vinyl to cut and use a sandblaster/chemicals to etch your plexi. If you have a laser there's a few more steps to do. First take the file from maker case, and import it into your editing program of choice (this could be Illustrator, CorelDraw, or Inkscape). Then you copy the front piece and make a third. This way you can cut one of the front ones, to make the wood beauty panel. Then add your design to the panel you plan on using for the acrylic. Unfortunately as amazing as maker case is you can only make square or rectangle box's. If you wish to make a more advanced shape, then you have to do some work by "hand". Hand making Finger joints takes some time, and a good bit of trail and error. I also recommend you take measurements of your material. Thankfully you can use some of the fancy tools in these editing programs like snap, duplicate and position. I recommend cutting out cardboard, or print it on paper and seeing if they line up. Step 2: Time to Cut and Etch ! 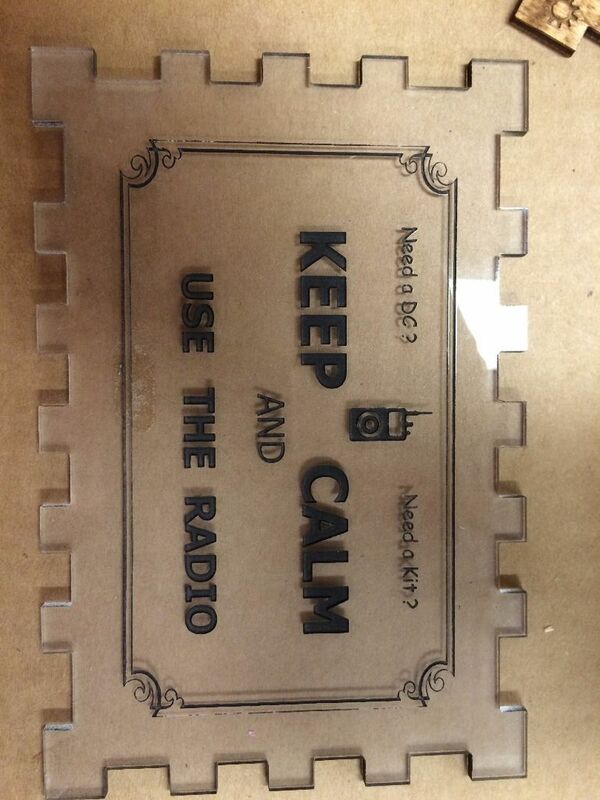 If you have used a laser cutter, leave the paper on your Acrylic, simply etch deeply thought it. If you etch to lightly then there will be goop left behind and the paint will not adhere correctly. This is where you get to play around with your fancy laser settings, or cut it out using a bandsaw/handsaw. I have not done much of it but I know you can etch both chemically and with sandblasting and cut vinyl. Step 3: Add the Lights ! This is the part that actually takes it from just a cool looking to box, to a cooler looking box with light ! If you've never messed around with LED light strips have a look at my tutorial here. So the Triangle has a mercury tilt switch, which I bought recycled off of ebay ( you can buy new ones, but mercury is really bad for the environment if it ever gets spilled, so by using used ones your saving them from a landfill) . Using these you can direct-drive each color of the RGB strip which draws about 40ma @12v. Ball switches are cheaper and safer but make noise, have a shorter life cycle, are more susceptible to "bouncing" and typically have low current ratings. I used a ball tilt switch in the light box with a relay, you can use a 12v relay however I did not have any at the time. (note if using a relay is is highly recommended that you use diode to prevent feedback) I made a plug that goes from a computer ATX (molex) 4 pin power connector, to DB9 (serial), there is a computer at the front desk right under the box, again I had a DB9 connector available to me at the time. The reason the strips are all cut up in the rectangle one is because again that's what I had to work with, I don't recommend doing this, unless you have alot of free time to waste :). This the best part, with the good paper backing that comes on Acrylic, it does not bleed at all. So lay down as thick or as many coats as you want. If you don't have the paper backing on it still, then you can use masking tape, but be careful of the bleed. Then you get to the best part, peeling off the backing ! You can use a paint marker, acrylic glue, rub-n-buff or a fine point sharpie to touch up all any missed sections. I use hot glue/epoxy/spray glue to attach the light strips, wire, switches and connectors. However I just wood glue to attach the box together, I sandwich the layer of Acrylic under the top layer of wood. I do this just in case you even have to take off the front and its the best way I've found so far. I also use masking tape to hold it together while it glues. Step 6: Finsh It ! You can sand it, stain and/or paint it however you like. I used a little too dark of a stain but it makes the wood look really nice. Do whatever you want to make it your own, add a shiny lacquer or clear coat. Could you expand on step 4? I see engraved, painted wood, then peeling paper. This seems to be the most important step of the project and has the least details. I'm curious how you get such a nice stencil from the engraved wood. I love the ProvHerb--that's hilarious!